In this tutorial we will learn how to generate surfaces from mesh automatically by using command RsAutoNurbs. Step 2: Select Import… from the File menu. The import file dialog box is displayed. 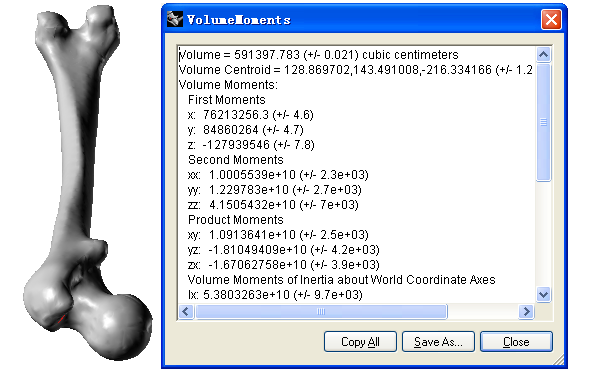 Browse for the file femur.stl (typically located in C:\Program Files\Rhinoceros 4.0\Plug-ins\RhinoResurf\ Samples\) and click Open from the Open dialog box . Step 3: Zoom to the extents of the drawing (View->Zoom->Extents). 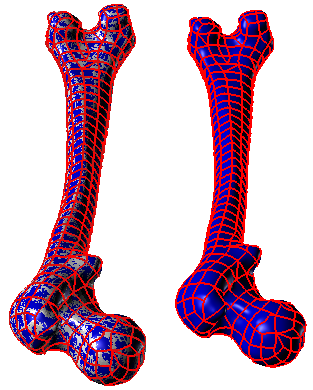 You will find the mesh from femur.stl imported into the current model. Click Automatic surfaces from mesh from the Resurf menu or type RsAutoNurbs at the Rhino command prompt or click icon at RhinoResurf toolbar . Step 4: The Rhino command prompt ‘Select mesh to create a nurbs surface' is displayed. Click left-mouse button to select the displayed mesh, then click right-mouse button after you selected the mesh. The dialog box will display. Step 5: Click button Curve network in the dialog box. The Curve network will generate automatically. This curve network is calculated by analyzing the curvature feature of the selected mesh. Step 7: In order to let curve fit the mesh much nicer, we increase the Control point number from 6 to be 7. 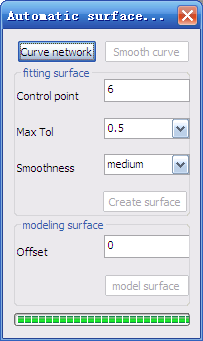 Step 8: Click button Create surface , the mesh will be fitted to be multiple surfaces. Step 9: Use Rhino command CreateSolid to convert this closed model into a solid.